Where you go to become a Bride. When the dress code calls for #unforgettable, choose hues of blush and bashful. Whether it’s princess-y ball skirts of glittery tulle or modernist gowns that flatter your form, these are the in-the-pink looks your bride tribe will be copying for years to come. Ready for a rosy outlook? Our body-beautiful bodices and sleek modernist gowns are the style inspo soul mates you’ve been searching for! Book Your Bridal Appointment Today! January - April are our busiest months. We recommend you book 1-2 weeks in advance for any Thursday or Saturday appointment. Please take a minute to read our Shopping Tips. Open Monday-Friday 11-6, Thursday 11-7, Saturday 9-4. Saturday appointments require a credit card on file. Spring 2019 Collections Have Arrived! was made for today’s free-spirited bride. and a rainbow’s worth of pastels. Open Monday-Friday 11-6, Thursday 11-7, Saturday 9-4. Saturday appointments require a credit card on file. of bridal gowns created for Mira Bridal Couture. The private label collection is moderately priced $950-$1500. Private Label Collection gown by Mira. With each new season brings a sense of change, renewal, and excitement for things to come … and the future is in full bloom with this beautiful new collection from Essense of Australia! Floral laces grow fuller, shimmering beadwork is elevated and simple silhouettes get a clean, modern update for a fresh look that will have brides seizing the days ahead. Wildflower Inspiration: Large, abundant blooms in graphic laces and 3D florals take precedence in this season’s collection. Artfully placed along the body and over illusion tulle, these laces flatter the figure and create stunning floating lace effects that today’s bohemian bride will love. Also featured in elaborately shaped trains, these natural florals make a grand statement with a sense of refined elegance. Gossamer Details: As sheerness continues to trend in bridal, this collection offers a variety of figure-flattering cutouts around the waist and hips that offer a sense of dreamlike beauty and bridal magic. Delicately layered with traditional laces, these ethereal details offer a touch of updated sensuality for the ultra-romantic bride. Shimmering Silhouettes: Fit-and-flare gowns are making an elevated style statement in this collection with dazzling mixed beadwork and shimmer fabrics. Layered with French tulle, these full, frothy skirts are illuminated in a natural sheen for the glamour-seeking bride. Modern Simplicity: Clean, off-shoulder details and classic V-necklines with open backs pair with voluminous skirts of crepe and organza, while fabric-covered buttons cascade down the backs of full trains for the simple yet utterly timeless look for the modern, royally-inspired bride. What an exciting weekend at Mira's! We have finished off September with some amazing brides and just could not wait to share them with you! Time to Pamper Your Bride Tribe! We are so excited to partner with The Facial Bar for an exciting giveaway! Register your bridesmaids at Mira Bridal Couture. Each bridesmaids will also receive $30 off! Once your party has completed their orders, your name will be entered into our drawing. Each order placed now through October 31, 2018 will receive $30 off. Dresses start at $150 before the promotional discount. Once you select colors, fabrics, and styles, your bridal consultant will complete your registration. To place their order, the bridesmaids will need to submit her measurements and a deposit of 60%. The winning bride will be announced before November 3, 2018 and will receive 4 pampering and well deserved facials for her and three bridesmaids. Facial Bar Facials include a double cleanse, exfoliation, LED treatment, mask and moisturizer. See store for further details. No cash value. Can not be applied to previously purchased or ordered merchandise. Not transferable. Book you bridesmaids appointment today and save $30 each bridesmaids! We are excited to give you a quick tour of Mira Bridal Couture. Ready to shop for your wedding gown? Book your bridal appointment here. Shimmering lace motifs waltz over allover lace in this romantic sheath wedding dress, comprised of tulle. Beaded spaghetti straps glide from the sheer bodice and illusion plunging sweetheart neckline to sheer back, also layered with lace motifs and allover lace. Finished with covered buttons over zipper closure. We are so excited to share our newest collection from Hayley Paige Occasions! Book your appointment today to meet with one of our bridal consultants, register your wedding party, and each bridesmaid that completes her order before September 30, 2018 will receive $30 off. Your bridesmaids don't have to look like clones from every other wedding. Dresses with open backs, glamorous fit-and-flare skirts and whimsical gauzy overlays are just a few ways to give your bridal party a fresh take. Removable chiffon floor length skirts, overlay bodices, criss-cross details, and satin edge details are just a few of the stylish touches you'll see in our newest collection. $30 off each bridesmaid good through September 30, 2018. To receive the promotional $30 off, order must be placed and 60% deposit placed. Not good towards previously purchased or ordered merchandise. See store for details. 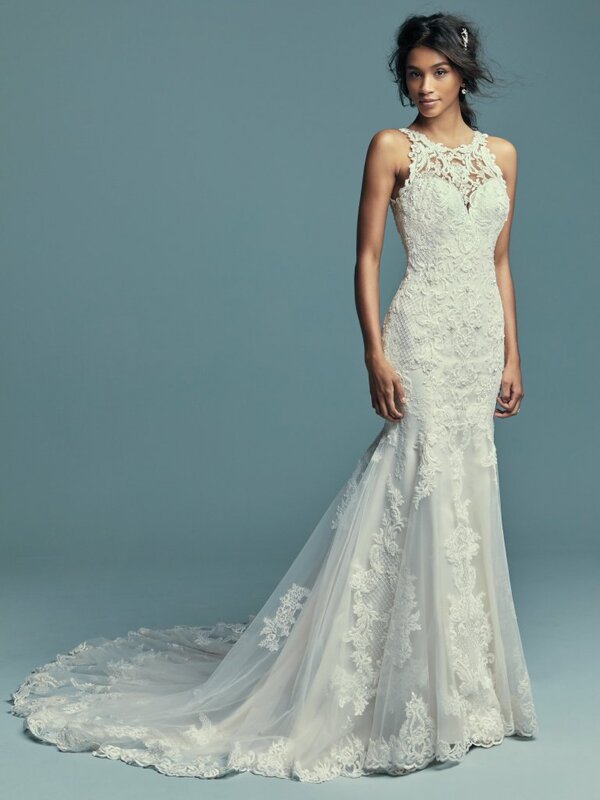 Gorgeous lace motifs cascade over tulle in this chic sleeved wedding gown, completing the illusion long sleeves, V-neckline, and illusion V-back. Fit-and-flare skirt features an illusion double-lace train. Lined with shapewear for a figure-flattering fit. Finished with covered buttons over zipper closure. Beaded lace motifs and Swarovski crystals cascade over tulle in this fit-and-flare wedding dress, featuring an illusion double-lace train. Beaded spaghetti straps complete the illusion plunging sweetheart neckline and illusion scoop back, both accented in lace motifs. Attached cold-shoulder sleeves accented in lace motifs can be removed easily to fit a bride‘s preference. Finished with covered buttons over zipper closure. and we are obsessed! Save $30 off for the month of September on each bridesmaid. Simply register your party and we will help with the rest. Book your appointment today. Promotion ends September 30, 2018. A bridesmaid dress that is both classic and modern, this style features a straight, strapless neckline, a natural waist, and gorgeous bobbinet fabric. A classic sheath bridesmaid dress with a twist, this look showcases feminine off-the-shoulder details and elegant chiffon fabric for an undeniably stunning look. This sleeveless A-line dress features a classic halter neckline, chiffon fabric, and a natural waist for a sophisticated bridesmaid look. Beaded lace motifs and Swarovski crystals dance over tulle in this sophisticated fit-and-flare wedding gown. Beaded spaghetti straps glide from illusion plunging sweetheart neckline to illusion scoop back, both accented in beaded lace motifs. Finished with covered buttons over zipper closure. Illusion cold-shoulder sleeves accented in lace motifs sold separately. Illusion cold-shoulder sleeves accented in lace motifs sold separately. Romantic lace motifs drift over the sheer bodice of this relaxed fit-and-flare wedding dress, drifting into an allover lace skirt. Illusion straps glide from sweetheart neckline to illusion keyhole back, both accented in lace motifs. Finished with covered buttons over zipper closure. Congrats! You’ve found your dream wedding dress, but that doesn’t mean the process is over just yet—you’ve got to get that gorgeous gown fitted perfectly to you and your shape. Whether your wedding dress needs just a simple hemming, a bustle added, or a whole restructuring, we’ve got the expert tips for wedding dress alterations that you need to know. Not sure what these tips entail or what exactly your wedding dress fitting timeline should be? Don’t fret! We’re answering all your burning questions with our own tips for wedding dress alterations, plus the wedding dress fitting etiquette you need to know. Wedding dresses aren’t typically made-to-measure, so very rarely does a bride’s size match a designer’s size perfectly. After you select your dream wedding dress, the bridal salon compares your measurements to the designer’s size chart and orders the closest size of gown. Once it arrives, the dress must then be tailored precisely to fit your shape and form. Bridal salons usually recommend that brides have three wedding dress fittings. 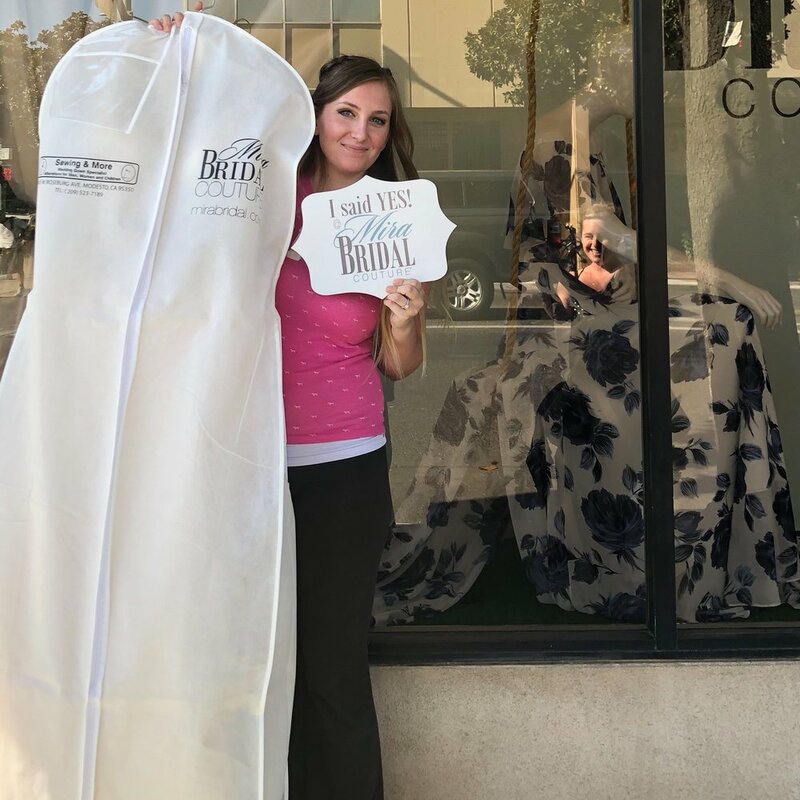 Schedule your first fitting to take place two to three months before your wedding day, the second fitting about a month before your wedding, and your final fitting at the two-week mark. Typically, your gown goes home with you at the final fitting—hooray! For your first fitting, bring the shoes and undergarments you plan to wear on your wedding day, as these can greatly impact the fit of your gown. Donning a pair of sky-high Badgley Mischka stilettos will require your wedding dress to be a different length than if you opted for a pair of sparkly Kate Spade bridal sneakers. Another pro tip for wedding dress alterations? 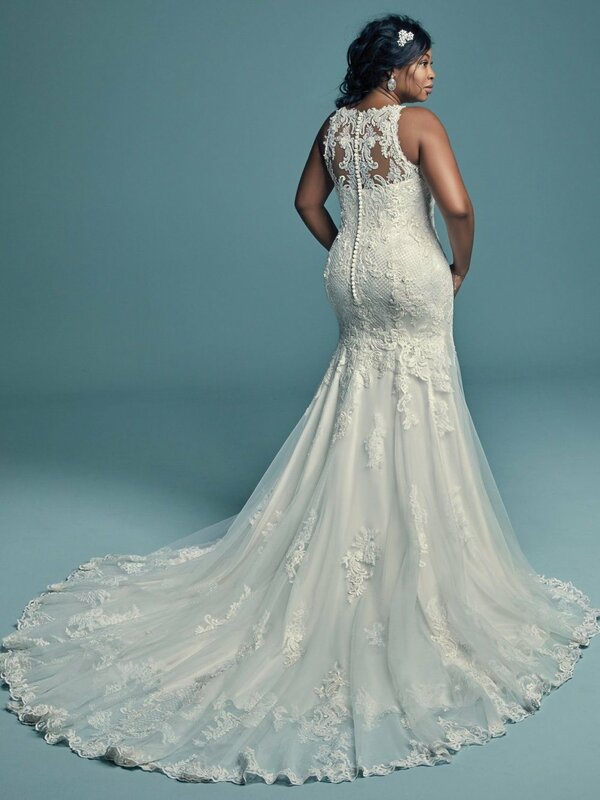 To ensure your dress is tailored to the exact fit you want while walking down the aisle, wear any and all shapewear or undergarments you plan to sport on the big day itself. During your first fitting you get to try on your actual wedding dress for the first time (woo hoo!). But be prepared—it probably won’t fit. 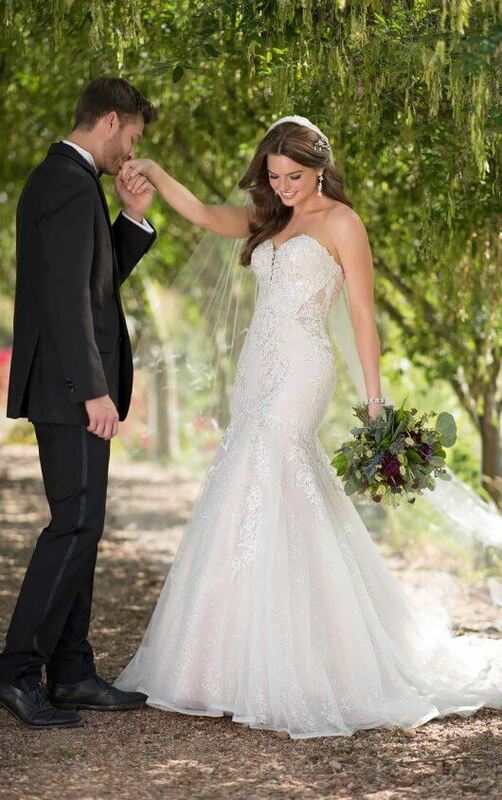 Be direct with your seamstress about how you envision your dress looking and feeling, and if there are any significant changes you want to make, such as adding illusion lace sleeves or altering the neckline. Also, don’t be afraid to ask your seamstress questions. One of our major tips for wedding dress alterations is to be open and honest about what you want in your bridal look. Your seamstress will do everything in her power to make sure your dress fits, so speak up if something doesn’t feel right. Being vocal will help you avoid having to book more fittings, which will ultimately allow you to stick to that wedding dress fitting timeline. 7. It’s proper wedding dress fitting etiquette to bring only one or two close friends or family members to get a second opinion. But just like dress shopping, don’t bring too many people—all those opinions will stress you out and make the tailor’s job that much more difficult. At the last fitting, bring your mom or maid of honor to get a tutorial in bustling your gown—they’ll need to handle this important task on your wedding day. We’ve worked with some very talented seamstresses over the years. Arte at Sewing & More has been an amazing partner in helping our brides look their best for their wedding days. She is located in Roseburg Square, just a mile up the road from us. When you are ready to book your alterations appointment you can call her at 209-523-7189. Her hours of operation are Tuesday - Friday 12-5 and Saturday 11-3. If you are unable to book your fitting with Arte, we also suggest Isabel at Creative Stitches. She is located on the corner of Sylvan and Oakdale Road. You can book with her at (209) 551-4315. This vintage-inspired A-line wedding gown features a beaded bodice accented in Swarovski crystals and sheer side insets. Beaded spaghetti straps complete the V-neckline, trimmed in illusion, and scoop back. Sheath skirt comprised of tulle with a princess seam slit. Finished with covered buttons over zipper closure. Classic yet striking, this fit-and-flare wedding dress features beaded lace motifs, crosshatch details, and Swarovski crystals over tulle. Lace motifs adorn the illusion halter over sweetheart neckline and illusion back. An illusion double-lace train completed the elegant romance of this look. Finished with covered buttons over zipper closure. Kristen and Tyler were married August 26, 2017. She is absolutely stunning in her low-back sheath beaded lace gown. We love how Lucy Munoz Photography captured her beauty and their day. Kristen, in marketing as a Social Media Influencer, Tyler, now a Personal Trainer and Physical Therapy Aid, chose to keep their ceremony and reception close to home. Their source of inspiration came from their hometown church in Patterson, CA. Their reception was held at The Century in downtown Modesto, just around the corner from Mira Bridal Couture. Visit BridalCoutureMag,com for more or pick up a copy of the latest issue at Mira Bridal Couture. 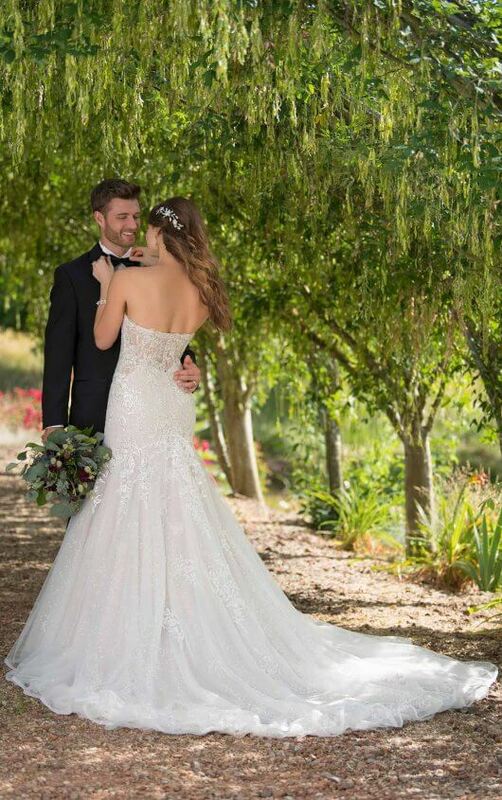 Mira Bridal Couture offers a contemporary boutique, nestled in downtown Modesto, CA. Locally owned and operated, we offer exquisite designer gowns, at surprisingly delightful prices. We think shopping for your dress should be an experience you’ll never forget, and our team of bridal stylists are there for you every step of the way!